It became evident that a greater precision water/methanol injection nozzle was needed. Committed to providing the best Water Methanol Injection parts, DevilsOwn stepped up again with the new DevilsOwn outside mount nozzle. 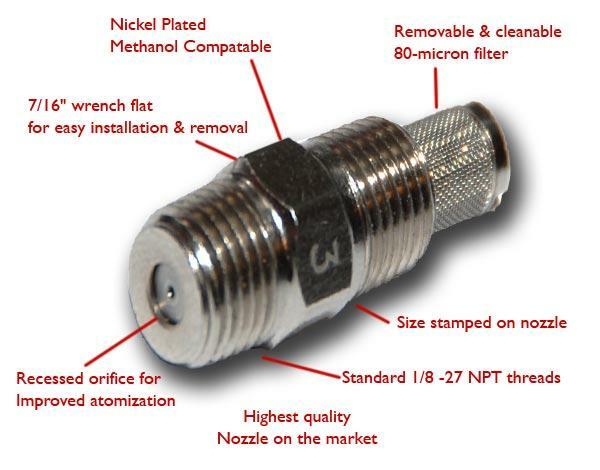 Its unique flow design provides superior atomization of water/methanol as well as more even distribution within the alcohol injection flow than other nozzles. Changing power levels takes only seconds and is simply a matter of changing the nozzle. DevilsOwn nozzles consistently deliver superior, long-lasting, trouble-free performance. Each nozzle is tested individually on flow rate, spray angle, balance, and uniformity of spray. You can't find a better nozzle anywhere. The DVL-2700 features 1/8' npt threads on the outside of the nozzle so that it can be screwed in from the outside of your intake. The removable screw-in 80 micron filter allows for easy cleaning, and the nozzles are nickel-plated to protect from methanol and increase their life. The DVL-2700 nozzles disperse the alcohol/water mixture into the smallest droplets possible at any system pressure above 40psi and produce a fog-like mist. They are small in size and weight and allow for maximum air flow into your intake without blocking it. DevilsOwn designed this nozzle unique with the orifice recessed in a chamber that induces a low-pressure area to improve atomization when air passes over the orifice. This dramatically improves atomization through the nozzle. 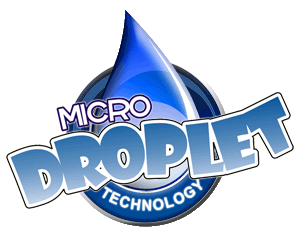 DO1 (100ml/min) Micro Droplet Methanol Injection Nozzle that produce smallest droplets on the market. Flow tested at 200 PSI. DO10 (970ml/min) Micro Droplet Methanol Injection Nozzle. Flow tested at 200 PSI. DO12 (1000ml/min) Micro Droplet Methanol Injection Nozzle. Flow tested at 200 PSI. DO14 (1340ml/min) Micro Droplet Methanol Injection Nozzle. Flow tested at 200 PSI. DO3 (370ml/min) Micro Droplet Methanol Injection Nozzle. Flow tested at 200 PSI. DO4 (440ml/min) Micro Droplet Methanol Injection Nozzle. Flow tested at 200 PSI. DO5 (520ml/min) Micro Droplet Methanol Injection Nozzle. Flow tested at 200 PSI. DO7 (640ml/min) Micro Droplet Methanol Injection Nozzle. Flow tested at 200 PSI.